Dragon Day is an annual event that occurs on the last day of classes before Spring Break on the Cornell University Ithaca campus. Cornell Architecture students create a huge dragon float and carry it down towards the Engineering Quad to taunt the Engineering students. 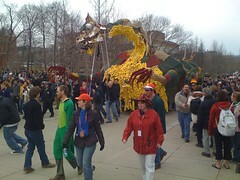 When the dragon procession reaches the engineering quad area, the engineering students block the path of the dragon with their own creation, a phoenix. A “battle” ensues and then the entire procession heads up along Ho Plaza towards the Arts Quad — where the floats are ceremoniously cremated in a bonfire. Note the Phoenix did not make it to the bonfire this year.